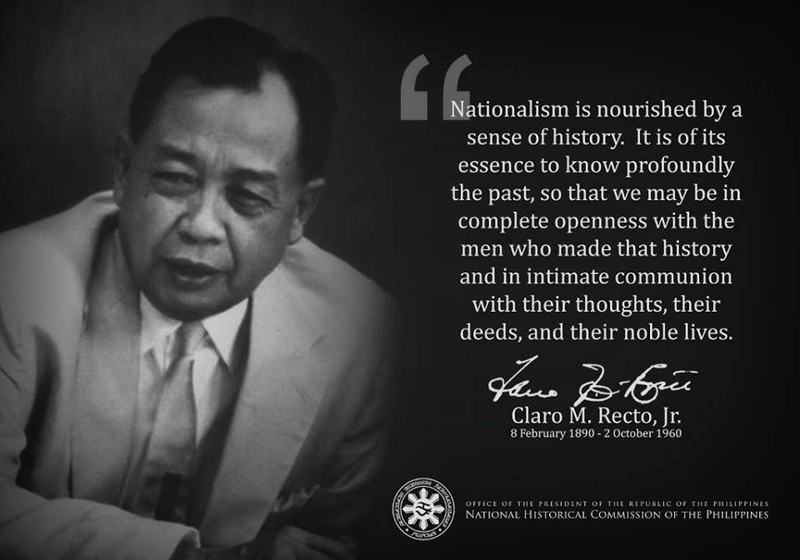 WHAT WE FILIPINOS SHOULD KNOW: One of the essential prerequisites for national unity and identity, thus nationhood, is the existence of a national language. Given that language is the primary source of social communication, it is an obvious reality that by speaking a common language, all people establish and confirm a strong, common bond reinforced by common memories. Conversely, it is also clear that linguistic diversity creates difficulties in establishing the common bond and instead results in maintaining and reinforcing differences between people. Thus, in all human transactions, including politics, a common language facilitates understanding and cohesiveness while linguistic diversity facilitates misunderstanding and divisiveness. This truism applies to a group of interacting individuals or all people of a given society/country. Below article is an important clarification on the much quoted saying by our national hero, Jose Rizal. ”Ang hindi nagmamahal sa sariling wika ay masahol pa sa malansang isda” is one of the most often quoted of Rizal’s writings. Why, then, did he write his two novels, Noli me tangere and El Filibusterismo in Spanish? In his dedication of the Noli me Tangere, Rizal wrote, “I will strive to reproduce thy condition faithfully, without discriminations.” Surely, the national hero of the Philippines was not somebody who said one thing and did the opposite. Both novels portrayed the social and political conditions of the time through characters that represented a cross section of Philippine society—the natives who were called the Indios, the Peninsulares or the Spanish who were born in Spain, and the Filipino or the Spanish who were born in the Philippine Islands—immortalized in the characters of Crisostomo Ibarra and his beloved Maria Clara, Elizas, Padre Damaso, Doña Victorina, and the sinister Padre Salvi. These characters represented the ideal and the despicable, the funny and the tragic, the truly comic and the merely ridiculous. There was enough in the novel to satisfy the Filipinos’ appetite for a good laugh and a love story--the more sentimental, the better—serving as a thin layer to hide the bitter satire. It can be said that Rizal’s two novels awoke the slumbering political passion of his countrymen so successfully that it quickened the birth of the Philippine Revolution. If this were Rizal’s aim, which most decidedly was not, he would have written the novels in Tagalog. Not only would this have been understandable to most people in Luzon, it would have hidden the revolutionary intent from the Spanish. As it was, the novels had to be distributed in secret among the Indios because the Spanish authorities banned those books. Which leads to the question of whom his target audience was in order to answer the first question of why he wrote the Noli me tangere and the El Filibusterismo in the language of the Spanish colonizers. So much has been written about Rizal’s extreme reluctance for revolution as the solution to the social cancer that was destroying his country, in contrast to his passionate advocacy of education and political reform. Evidently, the Spanish colonizers were Rizal’s primary target audience, hence, he wrote in their language. The Indio could have been a secondary target audience, perhaps in the hope that the ilustrados would fight for the socio-political reforms that were clearly indicated in the novels. There was no need to reproduce the social conditions of the time to the Indio who knew it only too well and constantly suffered from it. Rizal wrote the novels in Spanish because that was the appropriate language for his intent. Language is basically a tool, a means to express ideas and to communicate these, but before being a tool, language is first a reflection of one’s objective reality. Language is a symbol that represents the material objects in one’s environment. If an object does not exist in one’s material universe, one would have no word for it. For example, a person in search of gold in a certain area might show the natives a gold piece and ask what the natives call that metal and where he could find it. If there is no word for gold among the natives, it either means there is no gold in the area or the natives have not seen or heard of that metal before. When Rizal wrote the famous lines “Ang hindi nagmamahal sa sariling wika ay masahol pa sa malansang isda”, he was not referring to language merely as a communication tool but as an expression of one’s identity, of one’s individual and social consciousness. In the novels, Doña Victorina represents the type of Filipino who rejects her identity as Indio and who would do everything to deny it in every form, particularly in mannerism and language. More than a hundred years have passed since Rizal wrote his two novels but the social and eco-political structures remain basically the same. Only the ruling class has been changed, Filipinos have replaced the colonial masters. At the tip of an inverted pyramid is the very small minority of the power class that consists of the affluent and the Catholic hierarchy. At the top of this pyramid is about 80% of the population that have been assessed by the World Bank-IMF as living below poverty level. Between these two main groups is the middle class that shows no sign of increasing in number. Only a miracle would keep this unnatural pyramid from toppling over, but that belongs to another article. Undoubtedly, Pilipino (supposedly the expanded and enriched form of Tagalog) is not the language of the power class. Most of them speak English and some prefer to speak Spanish. The masses can read and speak Pilipino, as it is a required subject in school, but chances are, they speak their cradle tongue among themselves and most of the time, which would be any of the major languages and the numerous dialects. The language of the middle class is an odd mix of English, Pilipino, and their cradle tongue. Since language is a reflection of one’s identity, could we then say that the Filipinos have one national identity? Without a common identity, there could be no real sense of nationhood. This is what Rizal meant by that famous quotation that is often quoted but only the surface level. Pilipino is the national language but the preferred working language of government, business, and education as well as the mass media remains English. There would be nothing amiss with this if it were not for the great majority of the population whose knowledge of English is not functional. It is not surprising that government can get away shamelessly with graft and corruption because the masses have little understanding of what is going on. Clearly, language in Philippine contemporary society is the one big wall that divides the powerful from the masses of poor people, notwithstanding all the calls for people empowerment. One would think that the entertainment industry, specifically the movies and the television, might be a vehicle for uniting the people because the movies are still affordable and one could always go to the neighbor’s to watch television. Just take a quick look at the commercials; most of them are in English. Noontime and evening variety shows are probably the worst because the language used by the hosts and participants reflects the jargon of the “lost tribe” aka Manila people, which is a horrible porridge of English and Pilipino with an even more horrendous lack of grammar or logical syntax. So much for the local role models, let’s take a look at the school system. According to a DECS ruling, Pilipino should be the mode of classroom instruction. So far, this has worked, in some fashion, in the elementary grades and to a lesser extent, in the secondary and the tertiary levels. Textbooks in Pilipino have been published and used in the schools, but all the references remain English. In fact, teachers find it impossible to use Pilipino in teaching mathematics, algebra, chemistry, or physics, philosophy, etc. Not surprisingly, the pupil is subjected to a kind of mental lobotomy and eventually their soul is truncated, amputated, or dichotomised. Brave souls who perhaps wanted to “make a difference “ in the academe, have attempted to write their undergraduate or graduate thesis in Pilipino. Some succeeded, but one can’t help wondering if their theses would ever be taken down from the library shelves to be read and enjoyed. Few would have the courage to admit that they would rather read Rizal’s novels in English, not just because it would be easier for them but because the Pilipino translations are so antiquated that one would read it only under duress, which is to say, only because the school requires it. The Philippines, Indonesia, and Malaysia got their independence from their colonial masters at about the same time. All three countries created a national language that would be the expression of the national soul and, thus, be a unifying element. Sadly, Pilipino has not succeeded in being the language of the government and the governed, in contrast to how Indonesia and Malaysia has used their respective national languages. Indonesia does not use Dutch as the language of government, education and commerce. Neither do the Malaysians use English as their working language. An anecdote would illustrate this. A friend was on holiday in Kuala Lumpur. One day, she took a cab and, naturally, spoke to the taxi driver in English. In polite but cold tones, the driver asked her, “Madam, why do you talk in English? We are all Malaysians.” Nonplussed, she said she was Filipino and the taxi driver apologized and explained that she looked Malaysian. It might be an excellent thing for Philippine politicians to have experienced this, but then again, they would be more likely to hire a limousine (at Filipino taxpayer’s expense, of course) and lose the chance of being told to speak the national language by a lowly taxi driver. Is the Filipino then a “malansang isda”? Using the “isda” analogy, the Filipino might well be like a fish out of water, in the sense that Filipinos are supposed to be living in one country—the big sea—that has become an alien territory to citizens whose ties have remained regional or tribal rather than national. A fish out of its natural habitat would quickly die and stink. Rizal did not have all the answers to Philippine problems, but he has practically said it all. For the young, he collected folk stories and legends. For the more mature, he wrote the novels, Noli me tangere and El Filibusterismo, the two long essays “The Indolence of the Filipino” and “The Philippines a Century Hence” as well as poetry and countless articles. Jose Rizal is the national hero and his portrait is in the lowest denomination of Philippine paper money. Every Filipino knows Rizal, but do they understand him? Those who have read his novels remember only the love story of Ibarra and Maria Clara, the antics of Doña Victorina, and the pathetic Sisa. High School and college graduates are obliged to take the Rizal course as a requirement for graduation, but how many of them understand the two long essays relative to what is happening in the Philippines today, if they read it at all? Rizal has been iconized and even idolized by a sect that calls themselves “Rizalistas”, but the Filipino has yet to realize and actualise his relevance. - I think kaya spanish iyun kasi inilathala sa spain yung mga novels na iyan :) banned na kasi siya dito sa pinas nun kaya naisipan niyang dun nlang ilathala , Kaya kung tagalog po yun nakalagay sa novel niya, HINDI PO MAIINITINDIHAN ng mga spanish yung novel diba po? frankly, I haven't really looked yet into the reasons why Rizal did so.